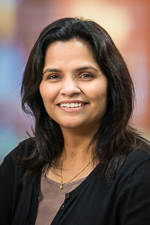 Dr. Deepika Sirohi is an assistant professor of pathology at the University of Utah School of Medicine. She received her MD from Armed Forces Medical College in Prune, Maharashtra, India and went on to complete her residency in anatomical and clinical pathology at University of Texas Health Science Center at San Antonio where she served as Co-chief Resident. Dr. Sirohi completed fellowship programs in Genitourinary Pathology at Cedar-Sinai Medical Center and Molecular Genetic Pathology at the University of California San Francisco. She is board certified by the American Board of Pathology in Anatomical and Clinical Pathology. Her research interests include genomic alterations in urologic malignancies, viral oncogenesis and application of next generation sequencing to solid tumors.